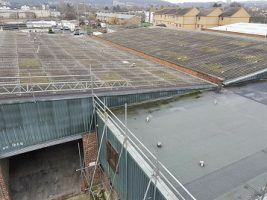 Brief Project Description: This will be our second phase of works at this location which will involve the replacement of two asbestos-cement warehouse roof areas and replacement of office flat roof covering. A combination of Kingspan insulated composite panels and an insulated built-up felt membrane system will resolve longstanding water ingress issues and give prospective tenants peace of mind that their new roof will be Building Regulations compliant and fully Guaranteed. We look forward to commencing on site and reporting the finished wok to you in the next few weeks.